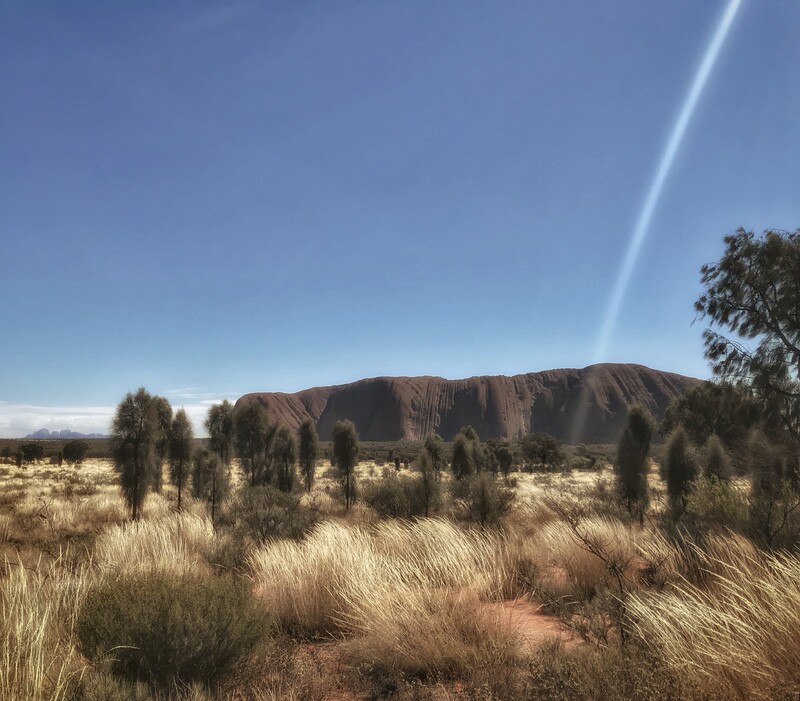 Very recently, I returned from a journey to Uluru and Kata Tjuta, in the center of my country, Australia. I spent much of my time there, walking around Uluru, within the folds of Kata Tjuta itself, and at a place across the South Australian Border, sacred to the Seven Sisters Songline. Sometimes I walked early in the morning, alone. Sometimes at sunrise. Sometimes with an Elder, entrusted with telling part of the sacred Stories. Sometimes with a small group of women. I had gone there, answering a call. I needed to go. I needed to heal; to be wholed and to re-member myself. Late, on the first day there, my face was smeared with ochre. I was reconsecrated to the land. Welcomed Home. I’ve been formally initiated into the Land by an Elder from the Darwin area, around 1990. The initiation I received was specific and personal. It involved my authority to work with certain energetics of this land, this continent, and the body. Body-Land. This journey was my return. 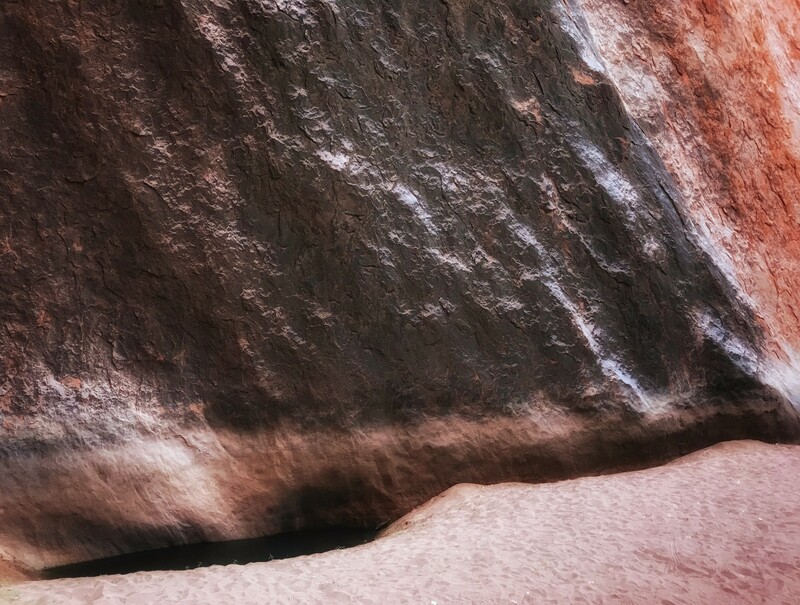 There are some places in Uluru where one is not allowed to make images. To view the markings, the shape of these rocks outside of their context is inappropriate; they need to be felt and known, in Place. Viscerally encountered. Embodied, if you like. 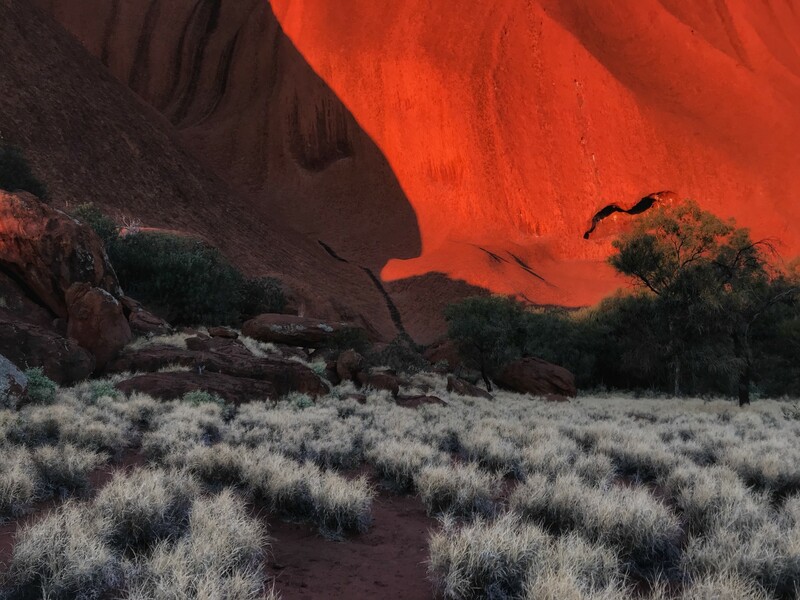 Uluru is considered a predominantly female place, by the Anangu (the Traditional Indigenous custodians). 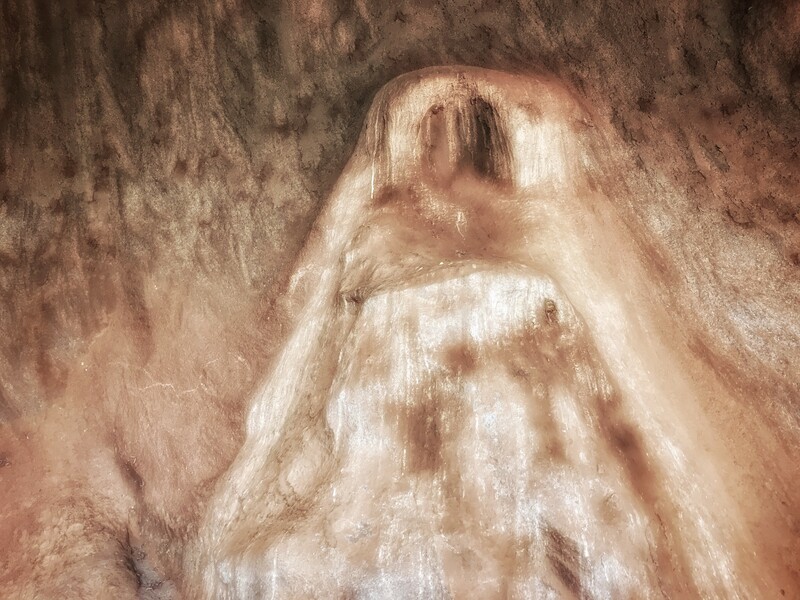 Whilst there are male areas in and around the rock, Uluru itself, is considered a place of the divine feminine. The Stories are inscribed into the rock. For the Anangu, these are regarded as living scripture. All of the lessons, the teachings and wisdom, lie around the base of the rock and on the surface itself. The energetic of the place is palpable. 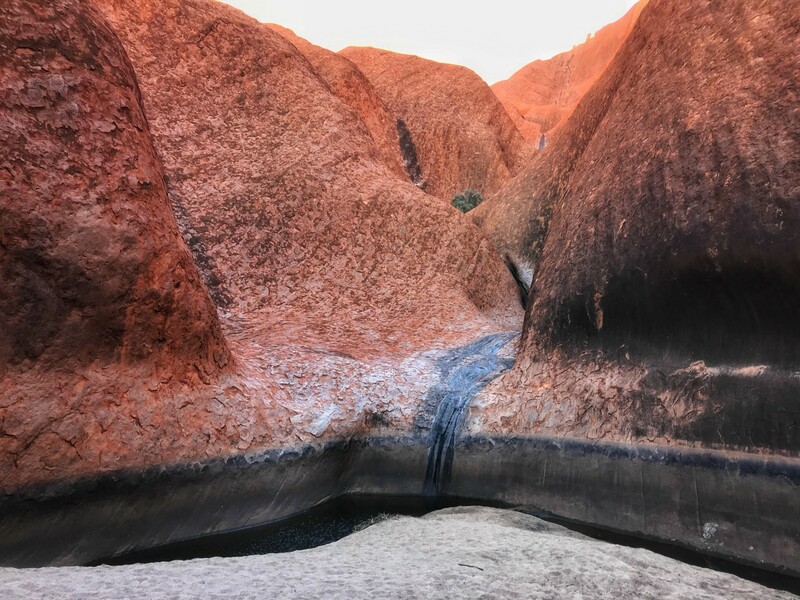 The Mutitjulu waterhole, open and accessible to all, lies as a mirrored surface, at the base of a series of majestic sweeping descending folds of the rock. The enveloping feeling, as you approach, is of a woman’s flowing cape, or hair. Of being benedicted and surrounded by Grace. And, of sovereignty. The markings on the rising rock tell the Story of Sacred Women’s Law. And yes, whilst this was shared with me, it is not my Story to tell, in full. Women must complete what they begin. There are many other markings on the rock, as one walks around the base. Places that arrested me with their startling, staring, visceral truth. Places that spoke to me of the deeply personal, and, of the archetypal. The sacredness of the relationship of man and woman. It is everything. 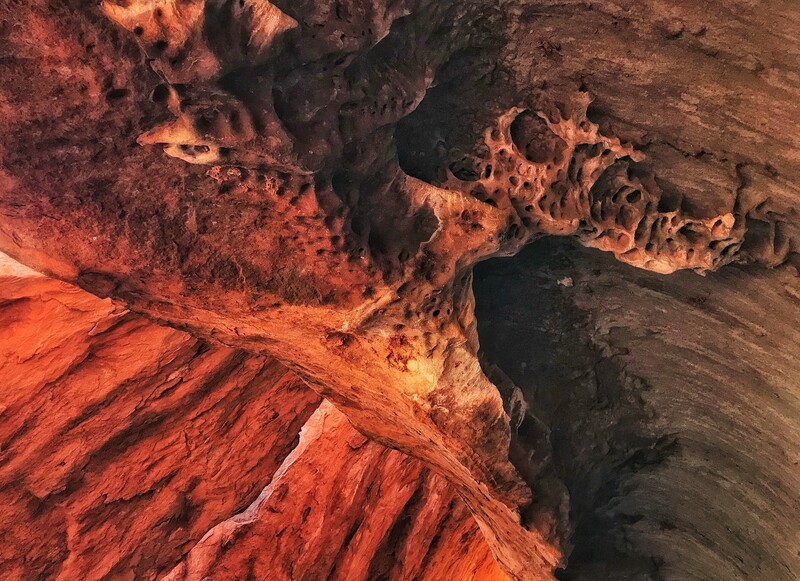 The Women’s Cave holds a stillness and resonance that contains generations. My presence there connected me with my own gathering of women in my family, among other experiences. To be enfolded within this space, is entering another dimension, another time. Everything suspends, stretches, spans. And, unexpected and unlooked for, deep truths arose within my awareness. Compassion and love were present. The tender Grandmothers. A holding within the depths of descent. Gradually, a release, a cleansing. Finally, a balm. Imprints, truths, never to be forgotten. The time that we are all walking through right now, this time of immense paradigm shift, is, among other things, a reclaiming of the sacred balance of divine feminine and divine masculine within each one of us. It is beyond gender. It is certainly beyond the patterns we have walked this long time, together. It is truly new. Let us hold one another tenderly, as we birth this, together. 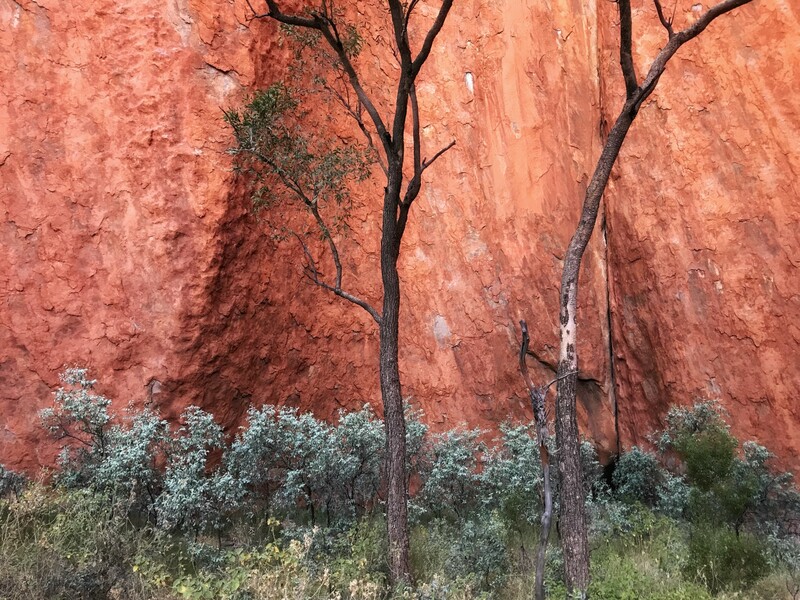 I am deeply grateful to, and honor, the grace and the wisdom and the compassion that was shared with me by three Elders, and by the land itself, at Uluru, Kata Tjuta and Walinynga. 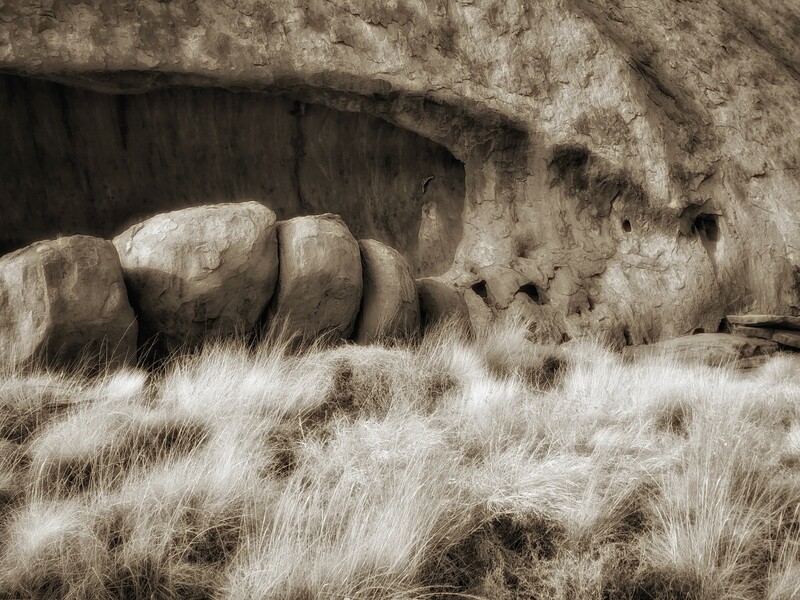 You can view more of my Photography, and read more about my Songlines Journey, at Embodied Terrain. Blessings. Woman of the Sea. Walker of Songlines. Photographer, Writer, Dancemaker, Yogi. 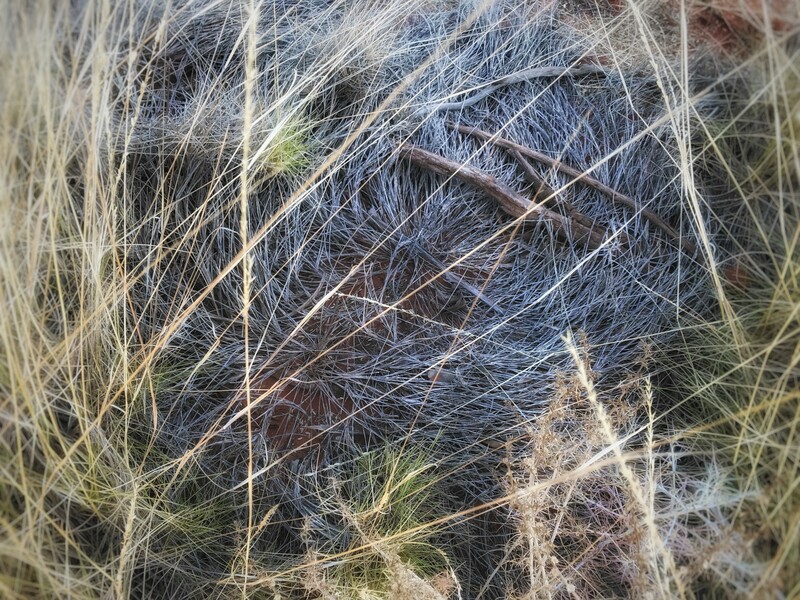 Saltwater Songlines: Embodying Sacred Earth-echoing the Body’s interior ecology.